Here's a nice run if you're staying in the Bayswater area of London: a loop through the elegant Notting Hill neighborhood and nearby Holland Park. Notting Hill is an interesting mix of Georgian-style homes and the famous street market along Portobello Road. 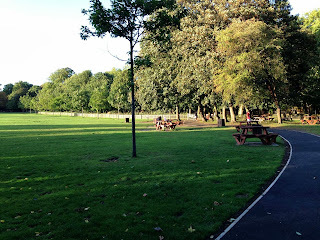 And an added loop through Holland Park adds some nice green-space to the run, immersing you in some soothing nature, which is a real life-saver in busy London. Without a dose of nature each day, London can soon exhaust any visitor. This run is pretty much an even mix of busy streets, quiet neighborhoods and parkland trails. 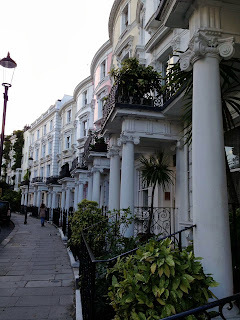 We'll start the run at Notting Hill Gate, close to many hotels, and it's a stop on the Central-, District- and Circle tube lines, so it's easy to get to. 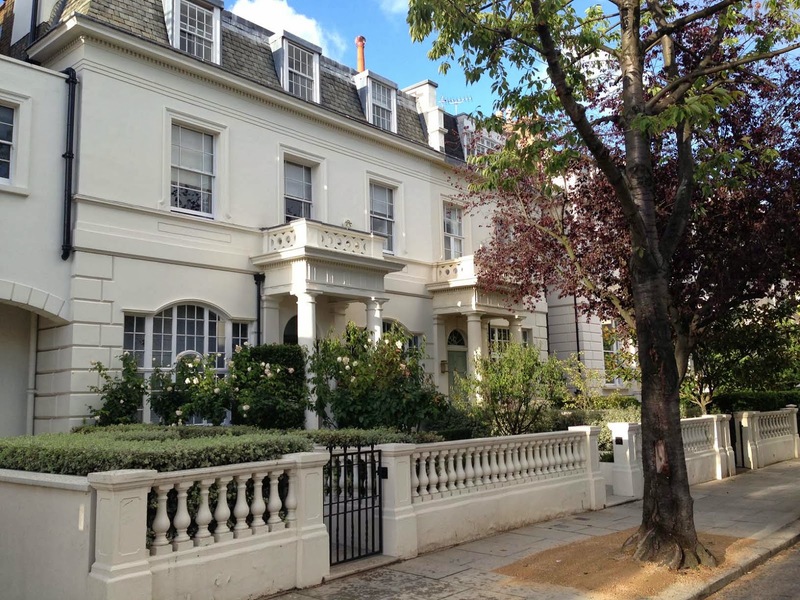 To start the run, face north at Pembridge Road and run for two blocks, where you turn left onto Portobello Road. The first part of the road is residential, lined with colorful cottages, then more shops fill the houses after you cross Cheepstow Villas. The market stands begin here, too. The market runs daily except Sundays. 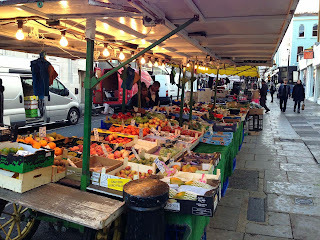 Some days the market sells new goods or fruits and vegetables, and on Saturdays the flea-market stands sell used stuff. 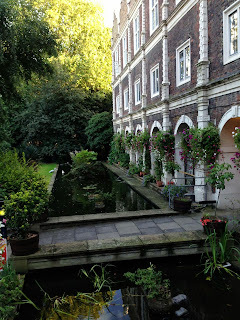 It has gotten pretty touristy, so you probably won't see anything along here that has a connection to the real London daily life, mainly souvenirs. Luckily, during most peoples' running times -- mornings and evenings -- the market is closed, and you won't have to deal with the crowds milling slowly between the stands. 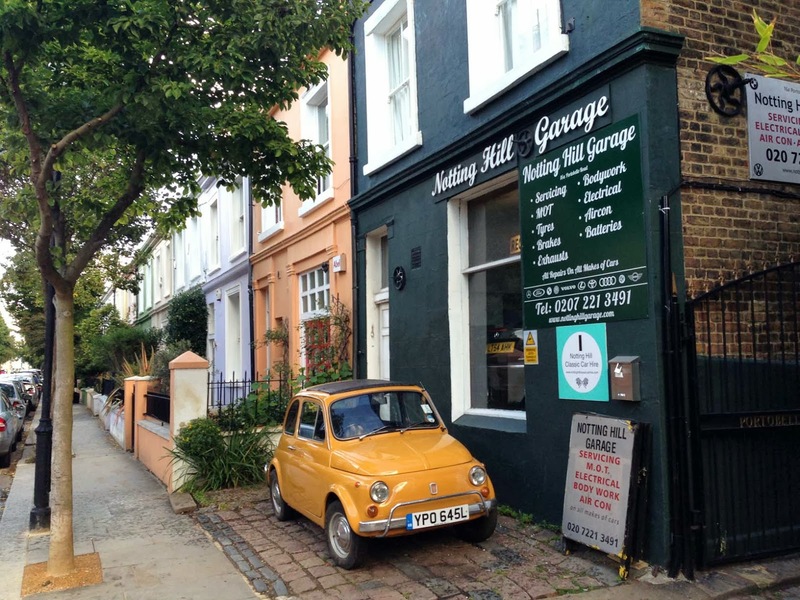 NOTE: If you're a big Notting Hill film fan, Hugh Grant's bookstore was located at 142 Portobello Road, a shop with a blue facade on the right side of the street. When you get to Westbourne Park Road, at about the 1-km mark, turn left to run one block to Kensington Park Road, and then turn left again to run back south along the street, parallel to the way you just ran. This street is quieter than Portobello Road, and the Georgian residential homes begin here, as you head uphill a bit. 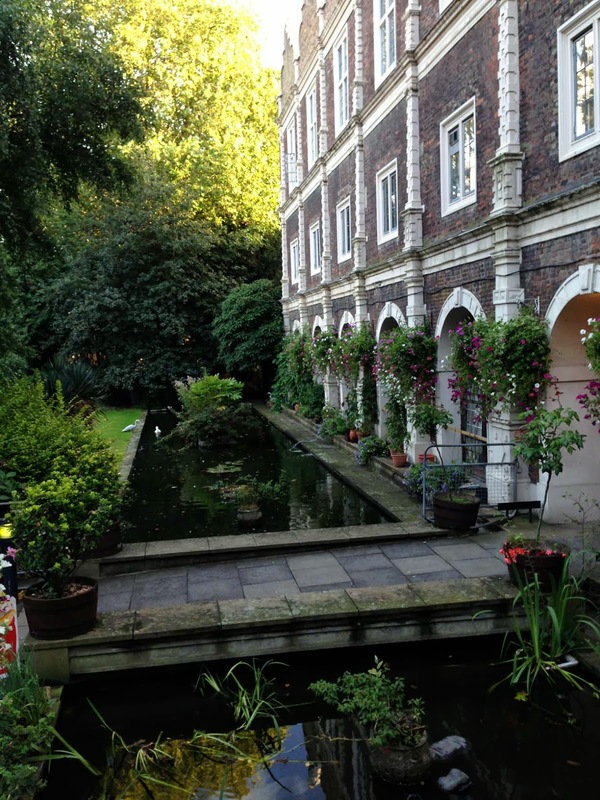 After about four blocks, you'll come to Ladbroke Gardens, where we'll turn right to run along this elegant street. The name changes to Landsdowne Crescent as it curves to the left, heading south. In springtime, some house-fronts are covered with blooming wisteria. When you reach St. John's Church, at the top of the hill, turn right at the back of the church and run downhill a block to Landsdowne Road, where you turn left and run south past more elegant homes to Holland Park Road. There is a tube station here, and some nice cafés and shops. Turn left on busy Holland Park Road and run to the next corner, where you turn right to cross the street and run south up Holland Park, past the statue of a Ukranian saint. This is the half-way point of the run. A look at the Mews, not bad! You'll run a bit uphill, as the street curves to the right. 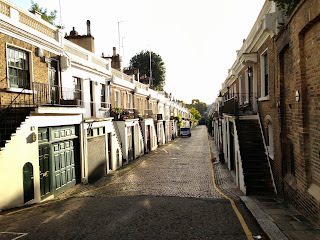 You might want to look into the second side-street on the right, Holland Park Mews, this cool street is a typical alley created for servants and deliveries for the villas along the main streets. Nowadays, the servants' quarters and stables have been turned into nice little homes of their own. 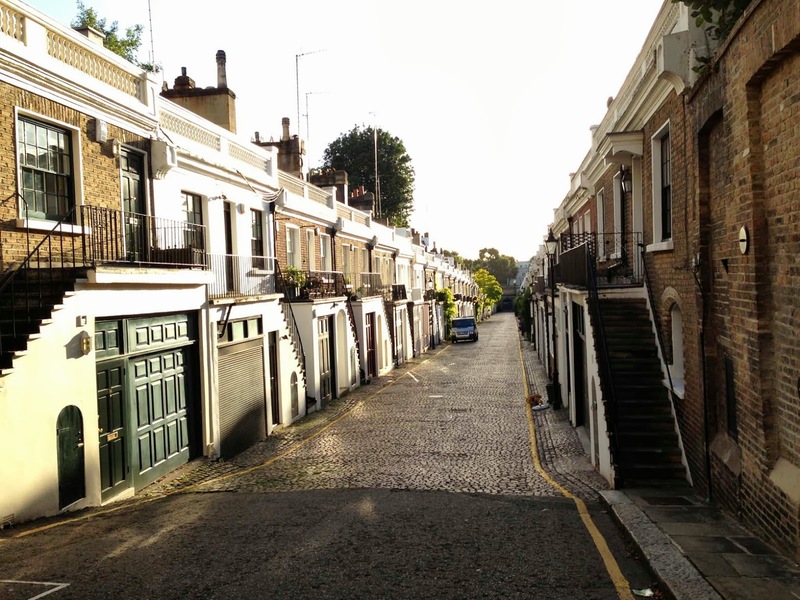 At the top of the curve, you'll see a white wall with a gate into Holland Park. Turn left to run through the gate and run up into the park. We'll now begin a 2-km loop of the park. 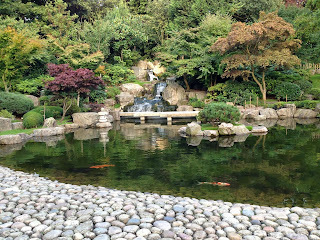 Run south to the seated statue of Lord Holland (whose land this once was), and turn right to run westward along the paved path through the woods until you see the sign for the Kyoto Gardens trail, where you turn left and run past (or loop through) the beautiful little Japanese Gardens. 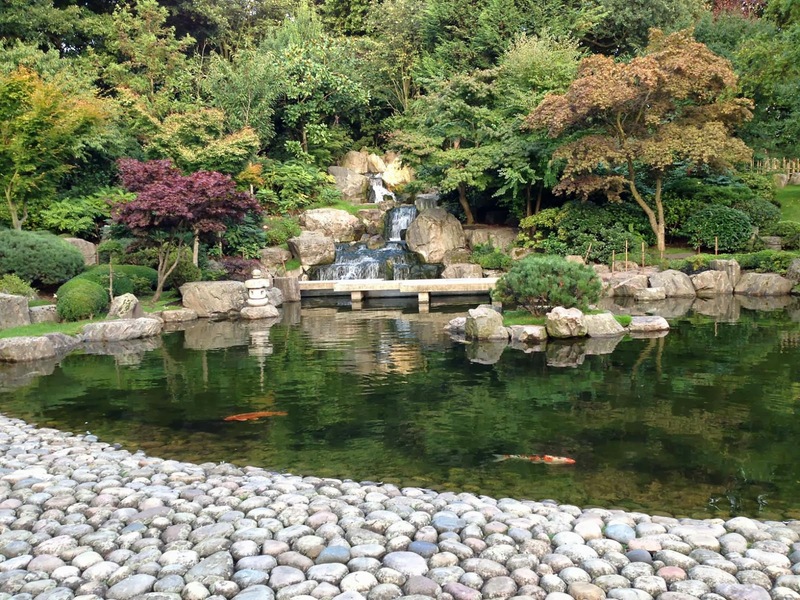 At the south end of the gardens, keep running south, and in 100 meters you'll come to another formal gardens. 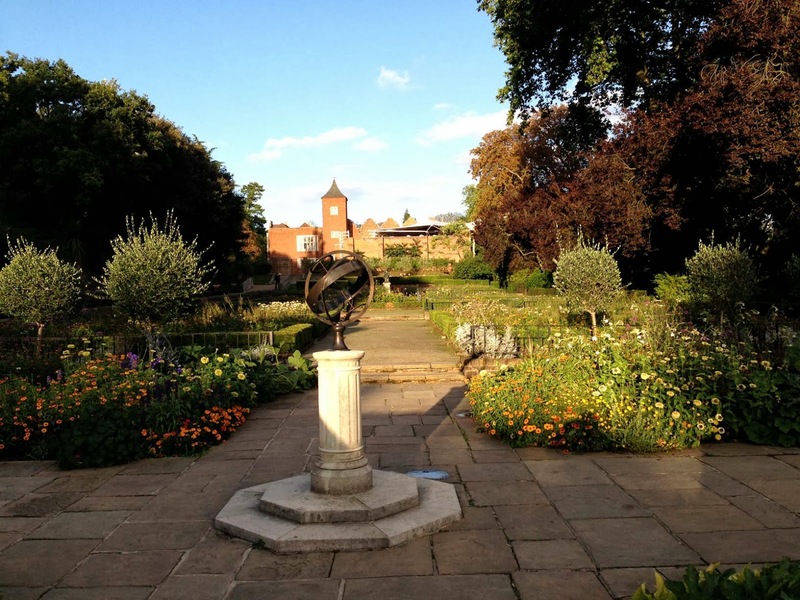 Run to the sundial in the gardens and turn south to run past the café and rose garden. When you hit the playground, turn left and then right onto the trail heading south along the athletic fields. Don't follow the street as it leaves the park, but get onto the paved footpath right along the edge of the field, going past the workout machines (very cool!) and then curving to the left along the south edge of the field. You'll pass the Commonwealth headquarters building on your right side, with its pointed roof. When you reach the southeast corner of the park, go through the little swinging gate and turn north (left) onto the paved path going north along the east edge of the park. You'll then pass the remains of the old Holland mansion, now used as a youth hostel. Much of the house was destroyed by bombs in the war, and an ugly new addition was stuck on it for the hostel. When you get back to the north end of the park, follow the path as it turns to the left and takes you back to the spot where you entered the park. Now head north back out the gate in the white wall, turn right, and run back along Holland Park to Holland Park Road. Now just turn right onto Holland Park Road and follow this street the last 500 meters back to Notting Hill Gate. The street is loud, but still quite scenic, with a lot of nice old houses.